The finals was a great one, would I say best ever… not really. It was however good basketball if it wasn’t staged. I mean back when I was growing up, teams won home games and the only way you won on another teams home floor, is if they fell asleep, you were just better than them, or you put in some hard OVER-DRIVE to get that final quarter in game five (“…smith, smith, smith, smith blocked again…” never gets old). These days guys are stealing games like it ain’t nothing. I predicted Spurs in 6, then after the Heat loss game one, I changed my mind to Heat in 6. The sudden change came when I saw the Spurs didn’t have much offense after Parker would be submerged into the court by Lebron’s defense. What I liked about the games was the media report on the games. Half the analyst in the NBA basketball world were totally wrong! After a Heat loss, they would say the Heat are finished, after a Spurs loss, they would say they will adjust and come back. What shocked me most was that it took five games before the Heat learned that Danny Green could actually shoot! What impressed me most is D-Wade’s ability to be unstoppable when he wanted. Overall, LeBron James and Dwayne Wade did something special… they won back-to-back championships, a terrible hard feat in the NBA. But do not relax Miami, the Bulls are coming, the Nets are coming, the Pacers are coming, and the Knicks are coming. I dare to believe Wade and James will sow up the decade making these guys who are coming, end up like Ewing, Barkley, Miller, and a long list of greats who couldn’t figure out how to beat the greatest combo nearly in sports (shot out to Scott Pippen). 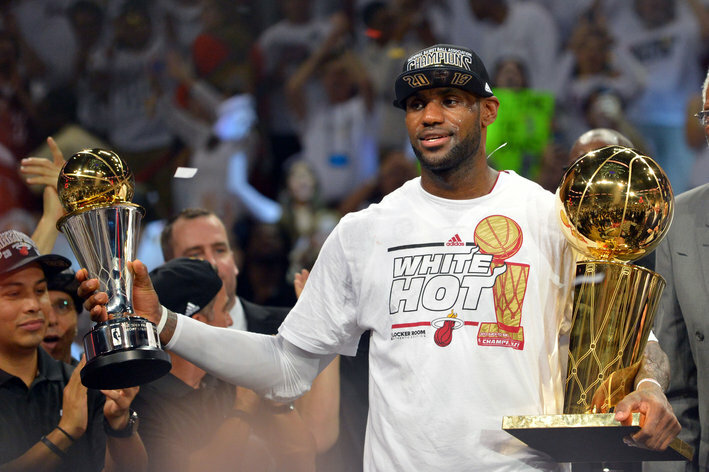 Let’s face a true fact that no one can dispute… LeBron is the GREATEST OF ALL TIMES…………………………………………………………………………………………………………. From Akron Ohio… oh you thought… man please! We’ll entertain that conversation once he has five or six rings. But he is a great one, no doubt about that. Watch more of the HEAT finals highlights here!